In an era characterized by globalized production and consumption of goods and commodities, the growing need for efficient and productive terminal operations continues to prove apparent. These facilities however in order to maintain and increase their market share have to constantly improve their operational practice, an exercise usually brought about by measuring and benchmarking its current operations against industry best or projected forecasts. Since the beginning of the decade all forms of cargo (general, dry bulk and liquid bulk) have registered an increase in shipping tonnage with Crude oil, petroleum and liquefied gas contributing to about half of the total commodities handled by seaborne traffic. Terminals, the link between sea going vessels and inland transportation, have and continue to play a vital role in the success of maritime transport. The competitive environment that exist amongst these facilities, port/terminal, makes performance measurement not only a powerful management tool for port/terminal operations, but also constitutes informative input for regional and national planning and operation. 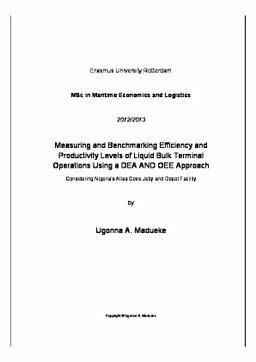 This paper focuses on the atlas cove jetty of the product and pipeline marketing company of Nigeria as its target terminal and compares its performance level on a both a macro scale and micro scale using the DEA and OEE benchmarking approach respectively. This thesis conducts an empirical study that indicates where potential technical efficiency gains for the PPMC terminal could be exploited. Thus providing them with insights that may guide them to initiate and execute development policy strategies that would yield a more efficient terminal. An extensive literature review on the subject matter indicated the possible use of the DEA technique to benchmark the performance levels of liquid bulk terminals as it noted to be widely used in similar exercises for container terminals and ports. Our DEA model compared the relative efficiency of 4 terminals shortlisted from a panel of 84 terminals on the basis of the class of product handled. In table 10 of chapter 6, we see the outcome of using a linear program to create a hypothetical composite terminal based on selected output and input variables of the four terminals in the module. We ran a linear program to minimize of the objective function with the goal of identifying if our target terminal was performing at levels relatively inefficient. The outcomes were inconclusive. As an extension to this approach, we decided to attempt a more concentrated technique and used the OEE approach to compare performance level of equipments and sub-processes within our target terminal and our benchmark terminal. We evaluate the Average Vessel Turnaround Time, the Berth Occupancy, and the Average Pump Rate and are able to observe conclusive outcomes shown in tables 13 and 14, chapter 6, that infer our target terminal indeed has potential technical efficiency gains to be exploited While the inconclusiveness of the DEA approach may have been as a result of limited sample data, this research concludes that the difference in asset specificity of liquid bulk terminals and container terminals support the limited review’s found on this topic. This infers that the approach is more suitable for the latter. Further study using the DEA is recommended, however the author opines that the OEE approach to benchmarking is a better suiting technique for liquid bulk terminals.